Classic Looks with a Touch of the Wild Side | Alcher Interiors, Inc.
Getting started on re-decorating a powder room, kitchen or family room can be quite a challenge. I mean, where do you start? With a color? Or a fabric? 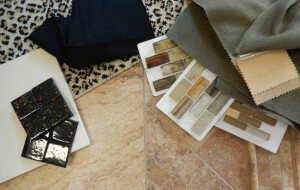 Or a tile you absolutely love? We thought it would be fun to gather all our sale products together and show you how you could use some – or all of them – in one project! Use Cesare’s Magnus rich gold tone stone-look large format porcelain tile on floors and walls along with the coordinating accent rails as a base in your kitchen, bathroom or fireplace surround. Then start adding textures and drama. Try Vetro Marmi’s 5/8” x 2” mixed brick slides in beige or mix 2” x 2” glossy ceramic wall tiles in Cheetah and Black by Clay Squared for wall accents. Stanton’s Leopard carpet provides that touch of the wild side through area rugs (or go nuts and do wall-to-wall!). Sturdy, easily cleanable fabrics from Schumacher and Larson provide your seating upholstery, accent pillows and window treatments. Check out Schumacher’s Gweneth Linen in camel, straw or hickory and Larsen’s black Puma cloth for the finishing touches. A neutral Coran ecru countertop keeps your room on the classic side. All products mentioned in this post are 20% off for two weeks starting August 17, 2015 through August 28, 2015. Stop in and see what you can do!